Resa med en liten grupp till Pearl Harbor, en av Oahu mest betydande attraktioner. Den här 6-timmarsutflykten inkluderar en guidad rundtur i USS Missouri plus fartygsinträde med en audiotur på USS 'Arizona Memorial. På Pearl Harbor Visitor Center, se filmbilder av andra världskrigets attack på Pearl Harbor. Kör sedan förbi de historiska sevärdheterna i centrala Honolulu, inklusive kung Kamehameha-statyn, Iolani Palace och Hawaii State Capitol. We loved visiting Pearl Harbor but was very disappointed in how the tour itself was handled. We expressly requested the 7:30 pick up to maximize our time at the site since we had a cruise ship sailing later in the afternoon. we called and spoke with Hawaiian limousine directly. We got picked up at 7:30 but then we waited at the port for over an hour to pick up more passengers. We had also requested to add luggage transport and were willing to pay but we were told that no bags at all could be brought. However the entire family picked up at the port had their luggage and it was stored in the van for them. To cap it off..at the end of the day we were rushed off site. I then call Viator to discuss directly with them but no one called me back.. never again Viator..just lost a client who loves to travel. Viator/Royal Hawaiian Limousine ran a very smooth operation. We had a good time. Very emotional and beautiful. History at its best. We were blessed to see a veteran who survived Pearl Harbor who was there signing his book about Pearl Harbor. A must see. Very well organised and plenty to see. Quite overwhelming based on the history of the location and the lives lost. Worth a look back in time and very real experience. This was a great tour that included both the USS Arizona Memorial and USS Missouri. Andrea, our driver gave interesting facts about Honolulu, Waikiki and Pearl Harbor on the way. She was very good at giving clear instructions on what we needed to do and how to manage our time while we were there. Once you're in Pearl Harbor you're in the hands of military staff rather than the driver. We had a set time for the Arizona Memorial and then had to manage our own time for the USS Missouri before our pick up time of 1.30pm. There was plenty of time at the Missouri to get a good feel for the ship. You can't take bags into Pearl Harbor but there is a bag check that you can pay for. Make sure you take a hat and wear sunscreen. On the way back to Waikiki Andrea took us on a few detours and provided some more interesting facts. Disappointed in the pick-up and return process. Significant delays were encountered on both counts which shortened our visit experience. Driver seemed confused at times with technologynew van A/C, smart phone name lists and handing our entry tickets. For the price we paid, we should have had access to the submarine and nearby museum. Tour company was great. Driver was courteous, prompt pick up and knowledgeable. 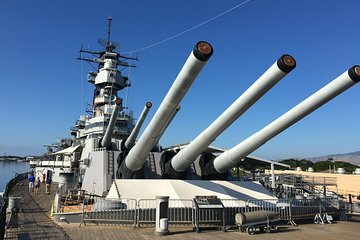 Most people got there tickets quickly but those of us also taking the USS Missouri tour had to wait extra time for the driver to purchase the tickets. I wish we had more time at the Pearl Harbor visitor center before hurrying to catch the return ride. We had to hurry off the Missouri and that left little time to take in the grounds and the shops. A MUST see for all visitors to Hawaii - very well and respectfully done - we should never forget!